As the buyer you will need to sign a Transfer of Water Right Form and pay the $25 transfer fee. Fill out an Application for Service. If forms and fee are not received on or before the scheduled final reading scheduled by the Seller the water service will be shut off and not turned on until all forms and fees are received. .As the renter you will need to sign the Rental Agreement Form and pay the $25 administrative fee. If form and fee are not received prior to moving in the meter will be shut off until all forms and fees are received. Bring a copy of the Warranty Deed showing you are the owner and legal description. For more detailed information, view the New Meter Installation Policy. Your address must be displayed for meter readers and repair work. Before any new installation can be installed, the address must be displayed and all building materials removed from the installation site. New meters will be installed along the road out of public right-of-way and next to driveways only. Do not park cars over the meter, plant shrubs or trees within a 10 foot radius of the meter, or block the meter in anyway from maintenance, repair or replacement. Any damage to the meter, pit or lid from neglect or abuse will be repaired and billed to the customer of record. 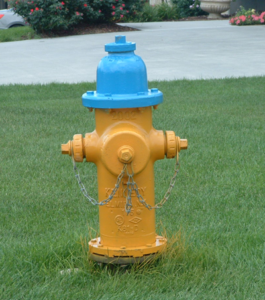 To see examples of landscaping placed too close to the meter, please visit the lawn irrigation.